The Apples In Stereo's previous release New Magnetic Wonder was one of my favorite albums of 2007, a true under-appreciated gem from the last decade. Full of ridiculously infectious ear worms, it was hardly the most fluid or cohesive of records, but it was just stuffed to the brim with tiny little nuggets of jangle-pop magic. How I wish I could say the same about the band's seventh release Travellers In Space And Time. It's not that the band has altered its style all that much, but in choosing to pursue a dance-oriented, electronic direction, the band has added a layer of cheesy, ELO-ish synths to their sound that is one more layer of preciousness than their already precious formula can handle. The hooks are still there...hell, the pop world doesn't have a more natural born hookmeister than band leader Robert Schneider, the guy bleeds bubblegum...but the music this time out has gone from endearingly cute to insufferably cute. Not surprisingly, the two tracks that make the strongest impression here are the two that most eschew the new electronic direction...the excellent Cut Your Hair-like rocker Dignified Dignitary, and the more intimate Floating in Space. Of the rest, only Dream About The Future, Dance Floor, and No One In The World emerge from the synth-heavy makeover without immediately inducing a gag reflex. And other than that, there's little to say. The Apples In Stereo have generated some wonderful pop albums over their near twenty year career, but for newcomers looking to dive into the band's discography, Travellers In Space In Time is definitely not the place to start. Cherry Picker's Best Bets: Dream About The Future, No One In The World, Dignified Dignitary, Floating In Space. Here's the official video for Hey Elevator, which perfectly illustrates the sugar-sweet overkill of much of the record. 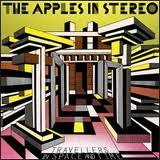 What are your thoughts on The Apples In Stereo's Travellers In Space And Time? Let readers know!